Adam West is gone. It happened Friday, June 9th, and it's somehow comforting to me that there's a good chance I was watching his work when it happened. 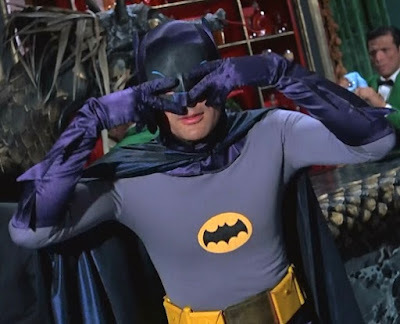 It's become a habit for me and my daughter to watch a few episodes of the 1966 Batman series at night, with the troubles of the day behind us. In those late hours, we can give ourselves over to the Technicolor world of Gotham City and its larger-than-life inhabitants without cynicism. We love seeing how Batman and Robin get out of each perilous cliffhanger, each deus ex machina ending more ridiculous than the last. Yes, Adam West was known for other work, but it was his turn as the Caped Crusader that made him an icon to me, and to millions of others. This is my tribute.